Standing in a new Black Turmeric variety in the hoophouse. 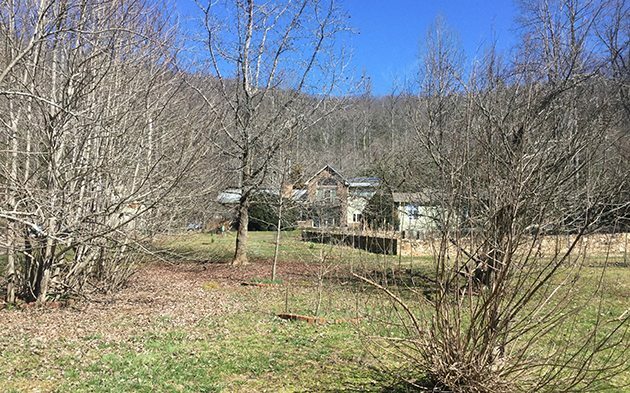 In 1981, my husband John Clarke and I traveled cross country from Oregon to Brasstown in our un-aircondtioned ’66 blue Dodge Dart we called “Grandma.” We were coming to the six month John C. Campbell Folk School Homesteading program. John had already been to the Folk School to learn woodcarving with Jack Hall in 1977 and had returned every fall (1978-80) when the blacksmiths and quilters were there. To our surprise, the Homesteading program had gone defunct, so instead we became Work/Study students and attended a two week furniture making class with Dana Hatheway. We made a gorgeous poplar desk we still use and love today. 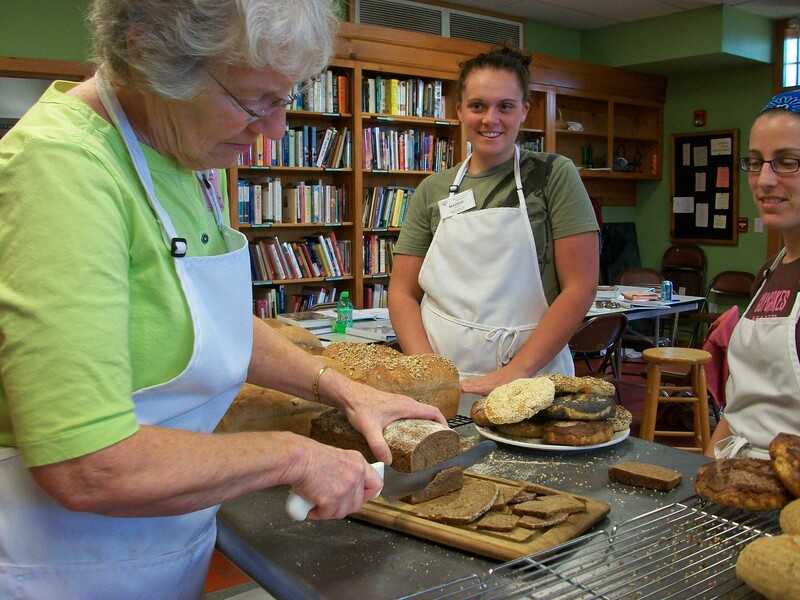 Carla Owen taught us the basics of organic gardening and Nanette Davidson showed me how to bake bread. Esther Hyatt was the director then and she let us stay on the third floor of the Keith House. 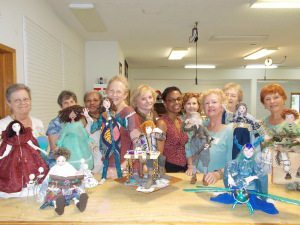 We took several two week classes (that’s how long the classes were back in 1981) including weaving, spinning, and woodcarving. We did a whole lot of dishes, gardening, and cleanup. The Dining Hall was in the downstairs of Keith House. 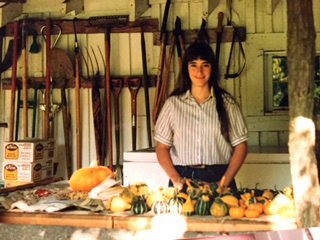 Eventually, we moved to Carter Cove where we rented a small house and started our first big organic garden in 1982. Gertrude Beach of Beach Cove Road became our good friend and mentored me on everything: wood stoves, kraut, cooking poke sallet and souchan, and planting by the signs. She was born in 1904 and taught us a LOT about mountain life and we still miss her today. This proved true and we worked hard for people doing many things: housecleaning, landscaping, carpentry and house building. 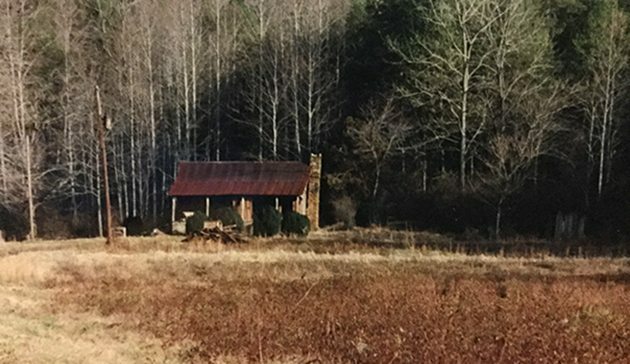 We dreamed of farming and were finally able to buy our own land on Qualla Road, moving there in 1994. John and I grew a huge garden and planted fruit trees and berry bushes. In 2001, we started selling “pick your own” red raspberries. We called ourselves Qualla Berry Farm. Our pre-garden field and homeplace. A new beginning as land owners on Qualla Road. In 2008, John became the Folk School Buildings & Grounds Manager. John and his crew (including the Work/Studies) maintain the Folk School’s 44 buildings and 300 acres, including all the gardens and landscaped areas. John loves his staff and his work. Back on the homestead, we continued to grow organic raspberries for u-pick until September 2011 when the drosophila suzukii fruit fly arrived on our berry farm and ruined our crop completely. Tiny larvae destroyed the fruit quality making the raspberries too soft and wet. 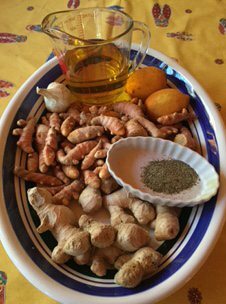 Our fall-harvested ginger and turmeric plus ingredients to make Carla Owen’s Spice Paste recipe: Black pepper, lemon, garlic, olive oil. Keep it in the fridge with a dose of apple cider vinegar. Use it in soups, veggies, casseroles, salads. 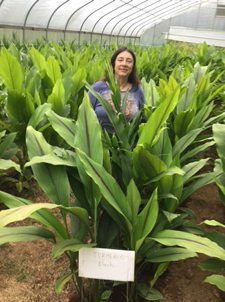 With the help of many people, especially Susan Anderson in Pittsboro and Glenn Carson in Murphy, we reinvented ourselves and began growing organic turmeric in 2013 for sale. In 2014 we added organic ginger in our unheated hoophouse. We begin indoor-sprouting our turmeric and ginger rhizomes from Hawaii this week. They will be ready for harvest in the fall. I am passionate about bees, butterflies, fungi, herbs, natural healing, organic agriculture & horticulture, native plants, and forestry. I love teaching at the Folk School. This spring I will be teaching a great weekend class on planting techniques that help pollinators. We will also focus on growing native plants. 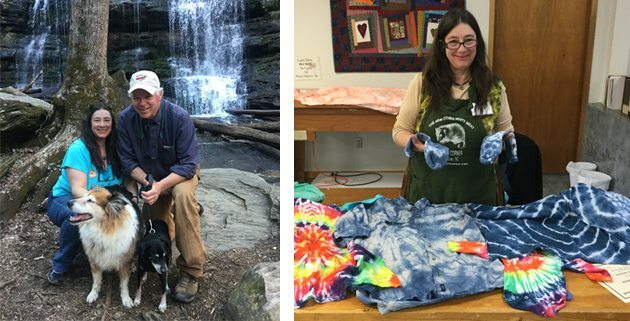 I am thrilled to be the new Nature Studies, Gardening, and Soapmaking Resident Artist and honored to follow in Tim Ryan’s footsteps. 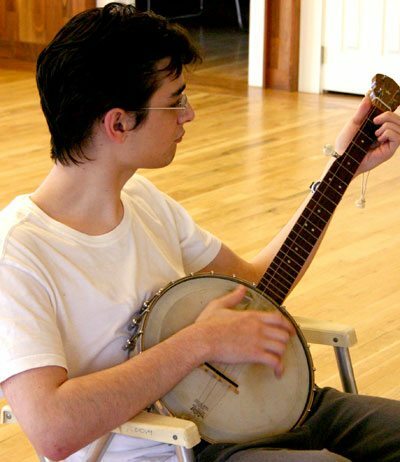 We have so much to offer here at the John C. Campbell Folk School, and I’m honored to be a part of it. 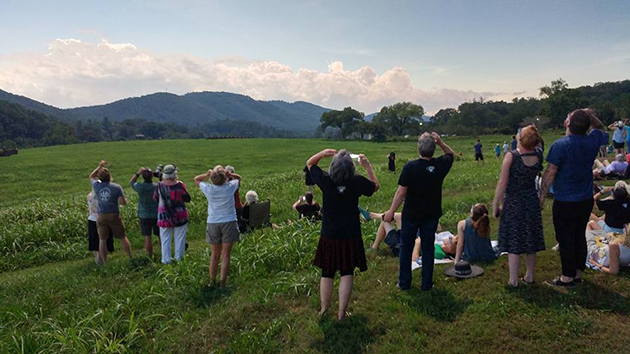 I will be posting and sharing lots of great information to encourage people to visit and share in the world we love here in Brasstown. Discover the amazing lives of pollinators, vital to fruit and vegetable production. Examine bee and butterfly foraging habits and reproductive shelters and learn how to create a pollinator-friendly landscape. We will visit garden and forest to identify plants and learn to propagate native perennials. Sow milkweed seeds (critical for monarch butterflies), divide bee balm, transplant coneflowers, and more. Also learn to maintain hummingbird feeders and install “bee condos.” Become an advocate for pollinators and the plants, crops, birds, and wildlife that depend on them! What an inspiring story. I look forward to meeting her. Love this story Karen shared for the post.Loved her then and love her now. Welcome aboard Res for Gardening!